Die Staatliche Berufsschule Kronach und das GTTI (Gedee Technical Training Institute) in Coimbatore/Indien arbeiten zum Zwecke eines gemeinsamen mechatronischen Projektes zusammen. Im Rahmen dieser Zusammenarbeit besuchen die indischen Schüler vom 10. bis 20. März 2016 die Berufsschule Kronach. Gemeinsam müssen mechanische und elektrische Komponenten montiert, verdrahtet und programmiert werden. Die Arbeiten werden sowohl in der Berufsschule als auch in den Ausbildungsbetrieben erledigt. Dabei sollen die indischen Schüler die berufliche Bildung in Deutschland kennenlernen. Im Juni findet der Gegenbesuch unserer Schülern in Coimbatore/Indien statt. Während unseres Aufenthalts in Indien werden wir eine Inbetriebnahme der Anlage durchführen, Optimierungen durchführen und eine Gesamtdokumentation erstellen. Die Robert Bosch Stiftung und das Goethe Institut unterstützen das Projekt finanziell und organisatorisch. Wir freuen uns auf unsere Gäste und die neuen Erfahrungen! Mit dem Leitgedanken der Robert Bosch Stiftung „Looking forward – working together“ wünsche ich unseren Schülern viele neue Impulse für ihr weiteres berufliches Leben. Hands-on training: Students from Germany and India working at the Gedee Technical Training Institute in Coimbatore as part of the training on the move project. 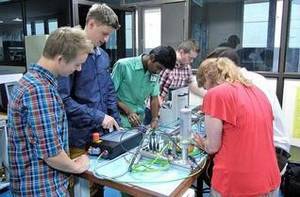 As many as seven students from Germany are in Coimbatore, working on a project jointly with students of Gedee Technical Training Institute. Together, they are developing a low cost conveyor system that can be used in industries to move components and products from one machine to another. Werner Zahner, deputy school head of Lorenz Kaim Schule, Kronach, and G.D. Rajkumar, director of the Gedee Institute, told presspersons here on Thursday that this was the first student exchange programme between India and Germany for the vocational training stream. Training on the Move, they said. Six students and one faculty member from the Gedee Institute were in Germany on a 12-day visit and completed part of the project. Now, after three months, seven students from Germany are in Coimbatore to complete the rest of the project. “It’s a new technology. It’s very important in modern industry to connect machines. Just one cable has been used in this conveyor system, which is both automatic and manual. The system can be attached to any existing machinery,” said Mr. Zahner. The students are from mechatronics stream. The Indian students underwent 16 hours training in Germany in programming. Such courses give cultural and international exposure to the students, they said. Martin Rojeck, head of the visa section, German Consulate in Chennai, said 12,000 Indian students are studying in Germany. Of these, 1,500 went from Tamil Nadu, Puducherry, Telangana and Andhra Pradesh last year. The number of students going to Germany is increasing by 10 per cent to 20 per cent every year. Most of them for their post graduate programme or research. Now, several technical courses are offered completely in English. Such student exchange programmes, especially in vocational training, will attract more students [...].